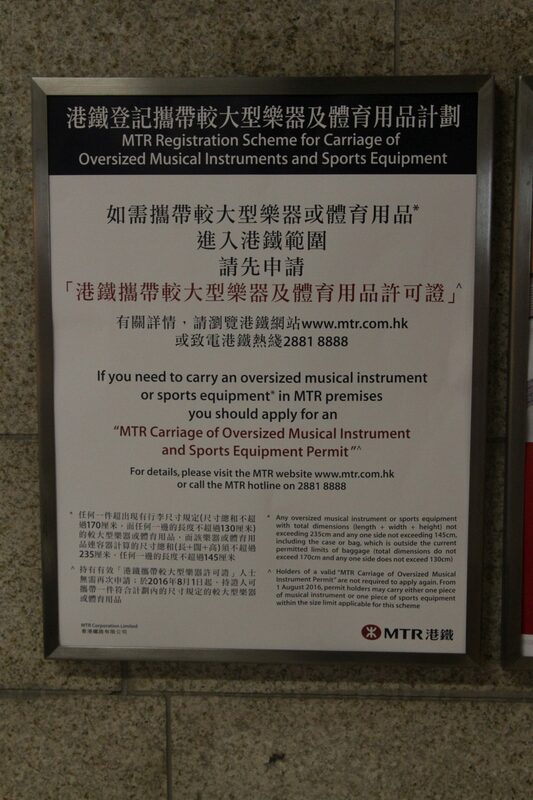 Does anyone enforce the 23kg weight limit and 1 baggage per passenger in the East Rail MTR Line in Hong Kong? 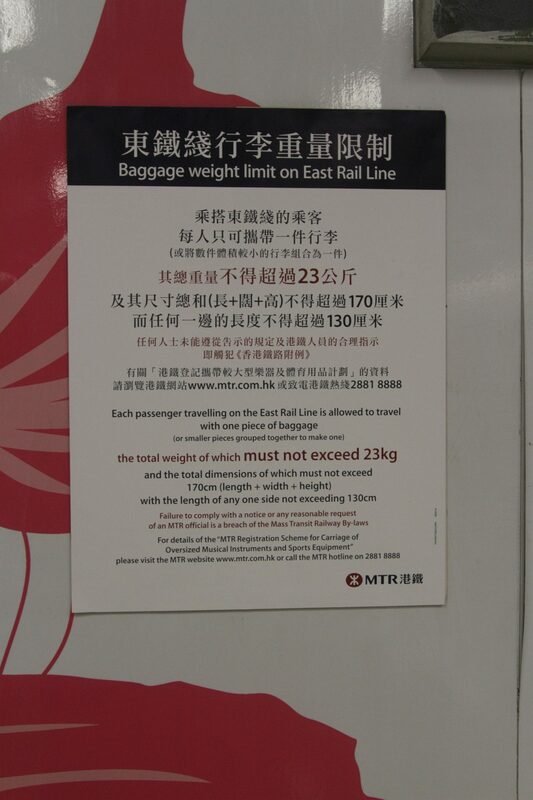 Does anyone enforce this 23kg weight limit and 1 baggage per passenger in the East Rail MTR Line in Hong Kong? E.g., would 2 baggages and/or a ~30kg baggage be typically fine? Short answer: Yes, the MTR by-laws are enforced by staff in the MTR by-laws enforcement team (附例執行組) and by-laws inspection unit (附例特檢隊). In most of the cases, these two units only target those whose baggage is obviously oversized or overweight, if they decided to focus on baggage rules on that day (but don't count me on that). However, if they decided to give your baggage an inspection, they could be extremely strict on the limit. Who enforces the Hong Kong MTR by-laws? (d) The MTR By-law Enforcement Team and By-laws Inspection Unit would enforce the MTR By-laws. Do these people actually work? Last year, a total of 2,643 prosecutions were made against passengers for breaking the MTR’s bylaws. The second-most broken rule, after failing to pay the MTR fare, was bringing prohibited items onto the train—most of which are classified as either too large or too heavy. Bylaw 27(a) prohibits passengers from bringing luggage onto the train that could potentially cause injury to others, or cause a nuisance. Last July, former professional snooker player Ivan Chan Kwok-ming was issued a warning letter because his cue stick was too long. Two months later, a student received a warning letter when he brought a cello onto the train. The cello was four centimeters too long. The cello incident caused an outcry among the general public, especially MTR was seen back then not doing enough to address the parallel trading activities and the nuisance it brings to the local community, e.g. in the Northern District. Do I have to worry too much? No, unless you are doing something visibly outrageous. On the other hand, look out (and plan) for officers having a bad mood on the day. To support this argument, let's put the numbers in perspective. As mentioned above there are ~2,000 prosecutions in a year, of which at most a half (as it is the second most popular offence) are baggage-related, that is around 1,000 a year. From 2008 to the first quarter of 2010, a total of 22,202 passengers paid a surcharge of HK$500 in accordance with the MTR By-laws and Conditions of Issue of Tickets for failing to produce a valid ticket while travelling in First Class compartments. This means those who enforce the by-laws tend to pick the low-hanging fruits, namely those who don't have a valid ticket for East Rail Line First Class, and hot spots for oversized baggage. Indeed, I have only seen the enforcement teams outside First Class and the adjacent platform area a couple of times during years of travelling on the system. As a result, in practice if you are not seen (by a staff, or a concerned member of the public) carrying baggage of visibly outrageous quantities that could cause a nuisance to others, you should be fine. Of course, be warned that in the unlikely case that an by-laws enforcement officer decided to enforce that particular rule, they can go very strict as reported by the SCMP article. ... to travel with one piece of baggage (or smaller pieces grouped together to make one). ...so two is fine as long as you can handle them. The same can be said regarding the weight of the baggage. Not the answer you're looking for? Browse other questions tagged trains luggage public-transport hong-kong or ask your own question. Do the Hong Kong metro lines have numbers? How many bags can I check in as part of the included luggage allowance on Thomson Airways? What's the minimum allowed free luggage for an Argentinian internal flight with LATAM Airlines? What qualifies as a “light personal hand baggage carried inside passenger compartment” exempt from the 6 HKD charge when taking a taxi in Hong Kong?